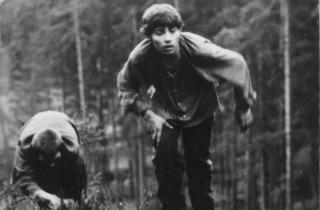 On a hillside in wartime Czechoslovakia, two young men duck gunfire and dash desperately for cover in the wintry woods. Starving and dangerously dehydrated, they take bread from a farmer’s wife and provoke another pursuit, this time by a community of rifle-toting geriatrics who treat the duo’s mortal scramble as sport. All the while, the younger of the two (Ladislav Jánsky) flashes back to his life in Prague, to the train bound for a concentration camp, and to the jailbreak that he seems fated to endlessly repeat. 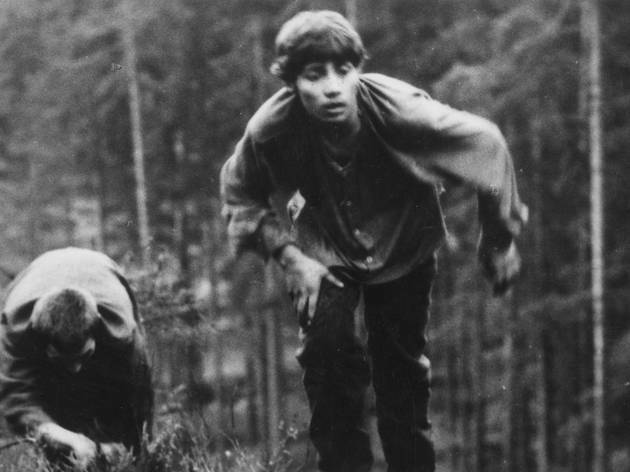 Best known as an early salvo of the Czech New Wave, Jan Nemec’s debut stunner feels even more potent now that it’s been freed of the expectations and delineations of a national movement. In 64 fleet minutes, we’re utterly and overwhelmingly immersed in a Jewish fugitive’s singular experience, from hunger pains to hallucinatory reveries. Nemec’s technique is as emotionally intuitive as it is masterful, purposefully scrambling past and present, handheld realism (a breathless opening tracking shot) and Buñuellian surrealism (fever-dreamed ants colonizing Jánsky’s angelic face). It’s a torrent of life—and cinema—in the face of death.